Properties in Paphos District average 4.7 out of 5 stars. Perfect location, south facing private pool, air con, TV & WiFi. Property 7: Perfect location, south facing private pool, air con, TV & WiFi. Detached Villa, Private Pool, WiFi Included, All Amenities close by. Property 14: Detached Villa, Private Pool, WiFi Included, All Amenities close by. NEW! Luxury 8 bed villa with magnificent roof terrace, 100m from the sea. Property 21: NEW! Luxury 8 bed villa with magnificent roof terrace, 100m from the sea. Detached Villa In Cul-de-Sac With Private Pool And Sea Views & Free WiFi. Property 32: Detached Villa In Cul-de-Sac With Private Pool And Sea Views & Free WiFi. 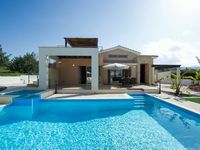 Luxury Detached Villa In Central Coral Bay With Private Pool - Car Not Required. Property 47: Luxury Detached Villa In Central Coral Bay With Private Pool - Car Not Required. Spacious and well equipped. Owners were quick to respond to a few queries. Very secluded in amongst the orange groves but quite a way down the track - follow the directions! Food provisions on arrival was a nice touch. We stayed for 3 nights in March for a party in the village (recommend the Stone Lion restaurant 10 mins walk away on the main road). The aircon units heat as well as cool plus there is a wood stove in the living area and plenty of blankets. For a couple of families with young children in summer this place would be lovely! The villa does need some TLC, other than that it is in a good location and is a good property.